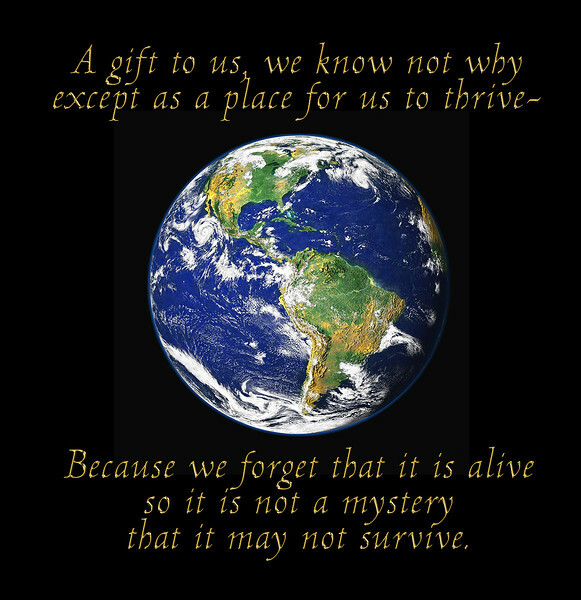 THE EARTH IS A GIFT THAT GIVES US LIFE. and to experience beauty and the magnificance of the creation. BUT THE EARTH IS THE ONLY ONE WE WILL EVER HAVE. But it is now, after decades of pollution and neglect, on a precipice. A few more years and its temperature will excalate out of control. WE WILL NEVER BE ABLE TO STOP THE TEMPERATURE FROM RISING. That is the subject of this website. We have treated the earth as if we could just order up a new one. We have devastated the landscape with pollution, chemicals, deforestation, over building, over population, river and lake contamination, ocean clogging with plastics, industrial waste, strip mining, fracking, oil spills, wildfires, invasive species, and countless others. And now fossil fuels are about to deliver the coup de gras. It has always mystified me why shareholder equity trumps nature and beauty no matter the consequences. How fossil fuel executives could drive ahead with full knowledge of the devestation they were causing. And they are still determined to push on, with the aid of our president with extreme risk, a risk of even making the planet uninhabitable. It is death among us. IT IS PROFIT AT ANY COST. All time record killing heat. unless we begin a world war on carbon, now. 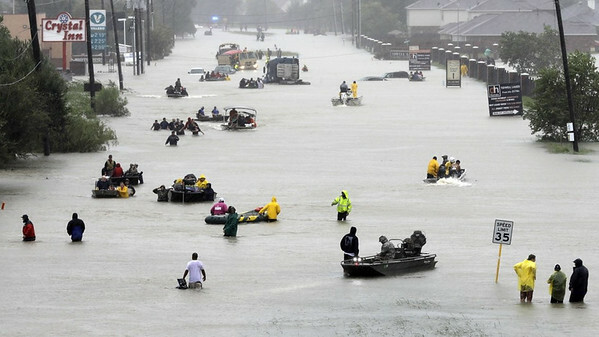 All time record storms and floods. 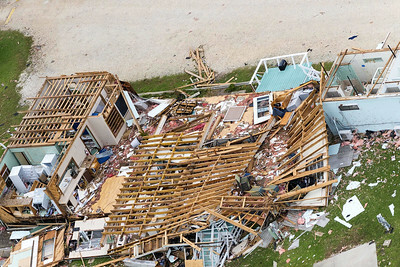 extreme weather events and much more. I. Upgrade the IPCC to a World Climate Authority able to enforce climate policy. II. Reduce carbon emissions world-wide the necessary amount in 20 years. III. Invest in new ultra-safe pre-fab nuclear power plants (see MIT Report). IV. Invest in negative-emision (carbon capture or air scrubbing) technology. V. Establish a scientific oversite panel to guide the IPCC. VI. Commit the wealth of industrialized nations as needed. VII. Send deniers to school. VII. Establish world-wide education programs. 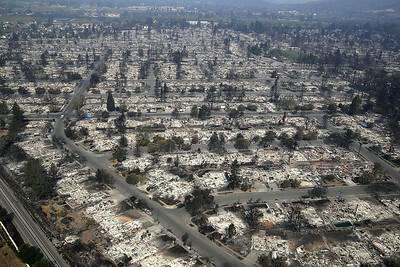 Below is a tiny sample of the disasters that have been created or exacerbated by global warming. The cause is NOT sun spots, regular climate cycling, or fake science. It is an insidious failure of those in power to study and learn the truth. putting the world and its people first. It is a crime against humanity. It is an airliner diving into the ocean, in slow motion. By 2100, Deadly Heat May Threaten the Majority of Humankind. Up to 75 percent of people could face deadly heatwaves by 2100 unless carbon emissions plummet, a new study warns. "What are we looking at? Some pics. This was the beginning, chapter one I guess. Where have you been? Up in the highlands. It's mostly in the 80s. About the coolest we could find. You grow your own food? Yeh. There's about 10,000 of us. Maybe a million left all told, Out of 10 billion. My god. What happened? Well now it’s chapter 9. About chapter 3 all hell broke loose. Then what happened? Hell, nobody was paying attention. They were all messing with power and migrations and lousy governments. Every 20 or 30 years it got worse. Storms with 300 mph winds. All the ice melted. They're no cities on the coast. Most of the lakes dried up. No water. Hot as hell. There are places it reaches 180°. So how much carbon? 800 or 900. So what happens now? Well its kind of settled down, but only about 1/10 of it is habitable. Lots of guys predicted it, but very few got it. How come? Nobody listened, at least the guys in charge who thought it couldn't happen. My god! How come you don’t know any of this? Couldn’t do a damn thing about it. Ran away. Temperatures like you wouldn’t believe. Wrecked the earth. How could it happen? Just the way people are. They see what they want to see. Hear what they want to hear. Not all of them, but almost all of those who had any power. It calmed down after a while. About Chapter 6. But then it was too late. Temperature running away. They ran out of money, water, food. You can figure out the rest. Yeh. We know some of it. How are you now? O.K. Like going back to a much older way of doing things. Simple. Lots of work. But pretty much we agree. Just like us, pretty much. We still have some rabble rousers, but they don’t have enough company to hurt us. They just have a good time drinking the stuff they make and yelling about us to themselves. Funny as hell. Reminds me of stories of the old days. But then it wasn't funny. Now it’s sweat and work." "Because of our collective failure to rapidly decarbonize the global economy and slash CO2 emissions, we are poised to leave future generations a grim legacy of climate upheaval." "The science is clear: climate change is the most serious threat to our natural world. To prevent irreversible damage to the lands and waters we all rely on, we must take immediate action now. our planet is being pushed toward a breaking point. "What will happen if we don’t act right now? Global temperature is projected to rise by 3.2°C, increased air pollution will affect 4.9 billion more people, and 2.75 billion people will be subjected to water scarcity." A scientific understanding is not necessary to accept climate change as real. However, it is a great stumbling block when trying to convince someone in authority of the enormous challenges we face and the extreme actions necessary to preserve a reasonable climate on earth. It may be the greatest stumbling block in the history of humanity and it may be a problem that is impossible to overcome. To help in understanding this delema, I have made the following a basic tutorial in climate change as it currently affects the earth. To understand it some knowledge of science is useful, because it is inherent in the nature of the material. In a subsequent section I will discuss the problem of convincing leaders of the urgency of the situation. We have ever faced a situation where decision makers, such as presidents of countries, need such an understanding or a science advisor who can overcome the leader's limitations. The essence of the problem is that we have backed ourselves into a corner in that urgent, difficult and expensive action now is required to avoid a calamitous future. Additionally, fossil fuel interests keep pressing to use their products despite knowing the harm they will cause. And unfortunately, because of present economic rewards the companies and their leaders may be part of the impossible stumbling block. 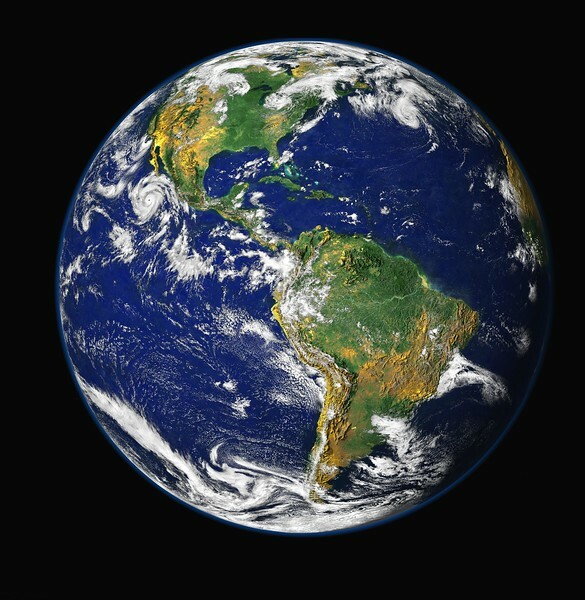 Figure 1: The atmosphere surrounds the Earth. The light from the sun either reflects from a surface or is absorbed by the surface. It all depends on the color. Lighter colors reflect the light and it never becomes heat. Darker colors reflect less light. The energy of the light must go somewhere. Surfaces of darker color absorb the light and become warmer but the warm surface radiates some of the heat back into the atmosphere. 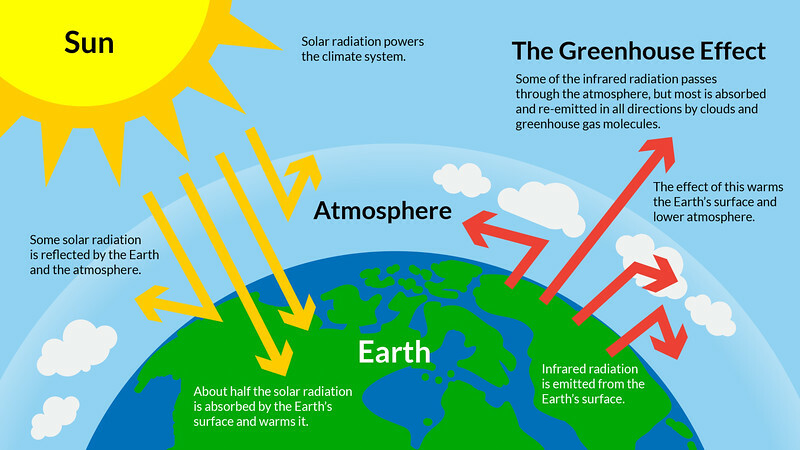 Some passes through the atmosphere, but carbon dioxide reflects this heat back and so, like a blanket keeping your body heat from excaping, it makes the air warmer and that's the problem. It's called the "greenhouse effect" because that's how greenhouses work. It is also why your car gets hot when it's parked in the sun. Fig. 2: This shows the amount of carbon dioxide over a very long period of time and the sharp increase (about 70%) beginning in the mid-19th century. Fig.3: This is a projection of future warming. The time around 2020 is very critical, it is an "inflection point" where the curve begins to turn sharply upward. It depends almost entirely on how much carbon dioxide is emitted by human activity. 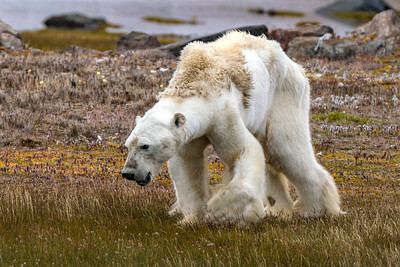 But the worst contributor to warming may become methane from melting tundra. When that happens there will be noting we can do to stop the warming. 3.6°F will be a huge problem. 5.4°F means we are out of control. That gives us 20 years to accomplish a miracle, to turn the worlds energy generation inside out. A commitment of all resources, more than World War II. Multiple "Manhatten Projects" like the one that created the atomic bomb. We will have to learn to scrub carbon dioxide from the air and sequester it in the ground. It will require all the wealth we have, trillions of dollers. The alternative is a disaster for which our grandchildren will suffer, curse us and and many will die. The red curve shows the temperature of the earth from 1860 to 2017. The data is supplied by NASA. The blue curve is my own projection of future temperature. 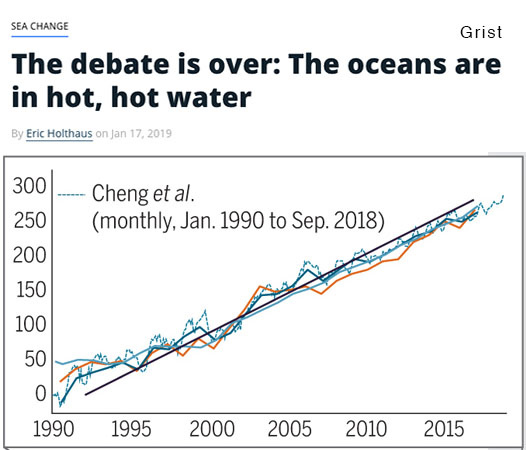 This projection is typical of those from many climate scientists. It assumes that carbon dioxide will continue increasing as in the past. The blue curve is extremely important because it shows what will happen if we continue business as usual. The Paris Accords were intended to keep the earth's temperature increase to less that 1.5°C, an increase generally accepted as "safe." However, "safe" is relative. 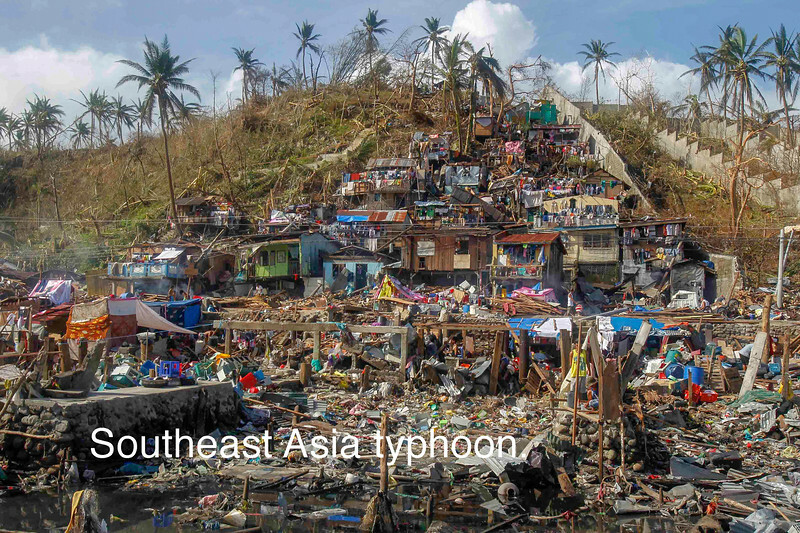 Horrendous damage has been caused already by an increase of less than 1°C. Additionally the anticipated difficultly of achieving 1.5°C has many scientists accepting 2.0°C as a more realistic target, however a target that would more radically change the environment. However, it is easily possible that without drastic reductions in emissions the earth's temperature could reach 5°C to 7°C in 2100, a true disaster. Fig. 4: The baseline is the level of activity we have been maintaining. The large black arrow points to the reduction we should be achieving to meet the goals of the Paris Accords. However there has been no significant reduction so far and an increase by the U.S. The reduction should be accomplished by about 2050. There is virtually no possibility of this and so the amount of carbon dioxide in the atmosphere will continue to increase, trapping more and more heat. 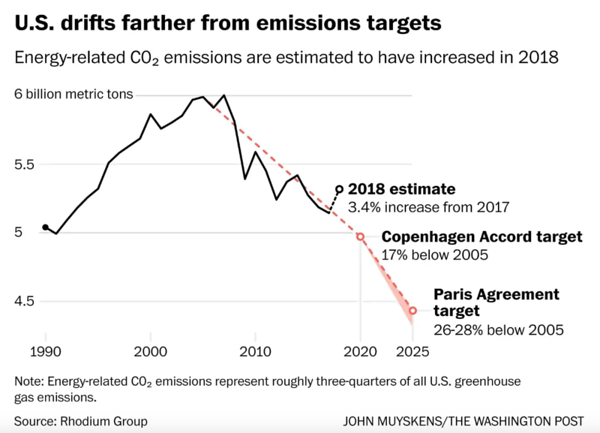 The figures below show the short fall in emissions reduction and the increase in emissions of the US in the Trump era. Note that reductions of 60% to 70% are necessary in the next 20 years. In the present state of complience this appears impossible and is the primary cause for concern. If these reductions are not met then the higher temperatures will accelerate the melting of the tundra and the release of large quantities of methane. Once this happens, the climate will be out of control and will continue to warm further for the indefinite future ultimately resulting in a sea level rise of about 150'. This is the cataclysm that is often spoken of. Fig. 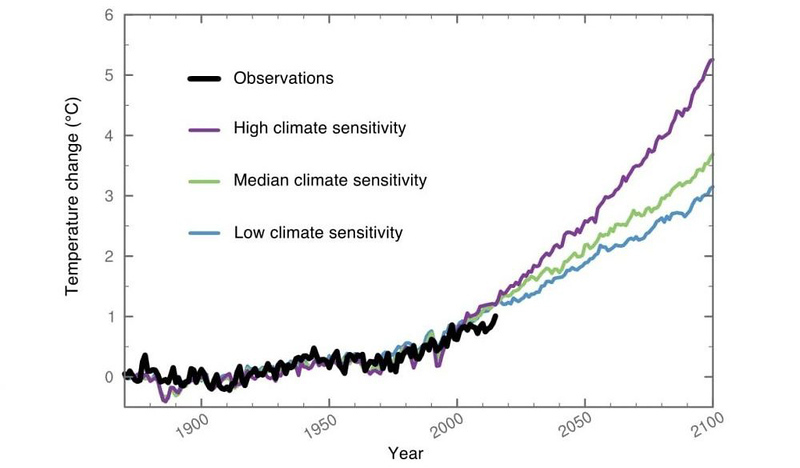 5: This shows a recent finding that the oceans are much warmer than expected and likely to increase warming. Fig. 6: This shows the large increase projected for 2018 due to the relaxation of EPA rules by President Trump. This is a major problem partly because it increases the amount of carbon dioxide in the atmosphere but it is of special importance because it sets a poor example for the rest of the world. A CLIMATE OUT OF CONTROL was beyond comprehension. Scientists warned, meetings were held by the United Nations, articles were written in the most prominent journals and newspapers. And yet something was not getting through. "Out of control?" could not happen. 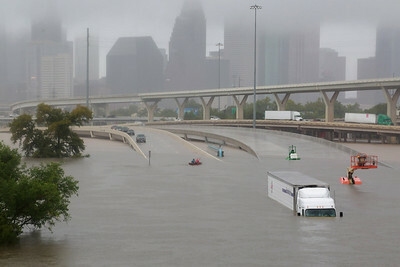 A warning that the ocean could rise as much as 170 feet collided with a human memory of a constant and reliable earth. Looking out of the window of an airplane or sailing the seas seemed no different than before, and so what was needed was not done. It had come to a place where the behavior of every country on the earth had to virtually reverse itself, turn upide down, and the focus had to change from all other issues to climate. But that was beyond comprehension to the leaders where it mattered the most. Scientists unfortunately spoke in clear, quiet and reserved tones, as they had been trained. The public and the politicians could not translate "it is highly likely" to it is "dead certain." Simultaneously many projects for renewable energy, electric cars, solar cells and wind mills were begun and were successful, but gave a false sense of accomplishment and security for there contribution was not sufficient to make the critical difference. FOR THE TRUTH WAS HIDDEN. It was power generation and transportation that had to reduce their carbon output, and primarily in the largest nations. And they did not understand, did not listen and did not take the actions necessary. The habits of maintaining the momenta of economies and of keeping political power were entrenched. And so "out of control" began to happen. The temperature rose high enough to begin release of the methane in the tundra, and was the beginning of the end. To stay in control, emissions had to be reduced drastically and quickly for too much time had gone by, and just as critically, it became necessary to augument the process by removing carbon dioxide from the air, something called "negative emissions," a process that was so expensive and challenging that it would not be attempted because it was felt it would hurt the present economy. The customary short-term thinking locked in the status quo. And so a failure to spend a trillion dollors now portended the spending of a hundred trillion dollors in an attempted rescue 50 to 100 years in the future. As the blanket grew, more heat was trapped, the temperature rose and every minute counted. But the major countries of the world: China, India, Russia and the United States were unable to rise to the occasion. I have struggled for years to find a way to picture the future, to create a kind of metaphor for what was happening. 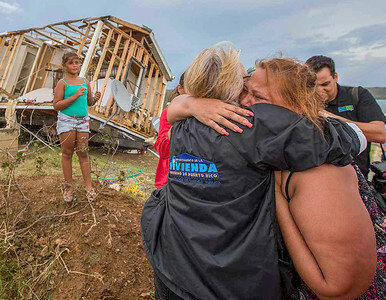 In the minds of almost all of humanity they were living in their secure homes and for the most part the weather was comfortable. But in fact they were being carried along in a current of inattention and blindness. There eyes were clear but their minds were captive to the past. I call the current The Infinite River. Climate change projections often focus on 2100. But the geological record shows that unless we rapidly reduce greenhouse gas emissions, we will be locking in drastic increases in temperatures and sea levels that will alter the earth not just for centuries, but for millennia. Physicist Klaus Lackner has long advocated deploying devices that extract carbon dioxide from the atmosphere to combat climate change. Now, as emissions keep soaring, Lackner says in a Yale Environment 360 interview that such “air capture” approaches may be our last best hope. "For two decades, Klaus Lackner has pioneered efforts to combat climate change by pulling carbon dioxide from the atmosphere. Now, after years of watching the global community fail to bring greenhouse gas emissions under control, Lackner — director of the Center for Negative Carbon Emissions at Arizona State University — is delivering a blunt message: The best hope to avoid major disruptions from global warming is to launch a massive program of CO2 “air capture” that will begin to reverse the buildup of billions of tons of carbon in our atmosphere." I have struggled for a year to summarize my view of climate change and to keep modifying that view as circumstances changed. The two articles above summarize my current view exceptionally well. This is the pivotal moment of our civilization and we have been horribly, morally and stupidly lax. It is truly now or never. The moral sins that we have committed are beyond the pale and they are getting worse. We could easily spend (and should) a trillion dollars now, in return for having a decent home for our civilization and saving a hundred trillion dollars in damages and repair for future generations, as well as likely billions of lives along the way. The following is a collection of sections of this web site (there is much that is out of site) and does not comprise a coherent whole. However, much is important to lend credence to the above. Some can be accessed by clicking on the links at the very top. Others have become obsolete or need rewriting badly and I must get on to other projects. I am aware of terrible writing, many typos and misspellings. I have spent a year trying to get this in shape and a trace of optimism has turned to despair. So it is what it is. If my wife had written it the writing and spelling would be far better. 1. 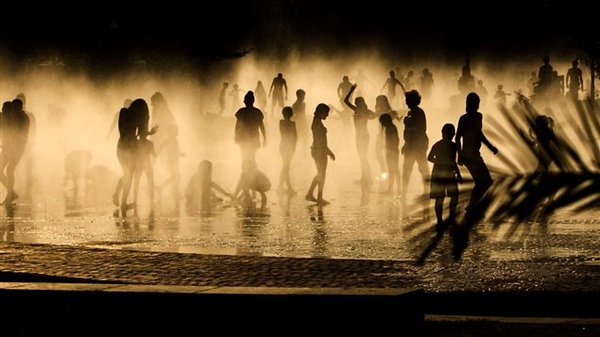 National Geographic: By 2100, Deadly Heat May Threaten Majority of Humankind. JAMES HANSEN HAS BEEN THE LEADING AUTHORITY and spokesperson on climate change for decades. He has just announced the "last chaper" in his comprehensive analysis of what is coming to the earth and its people. The blue link above is a pdf of his paper. Below is a brief ourline of that paper. You owe it to yourself to read both. Following that are my comments on risk. 1. 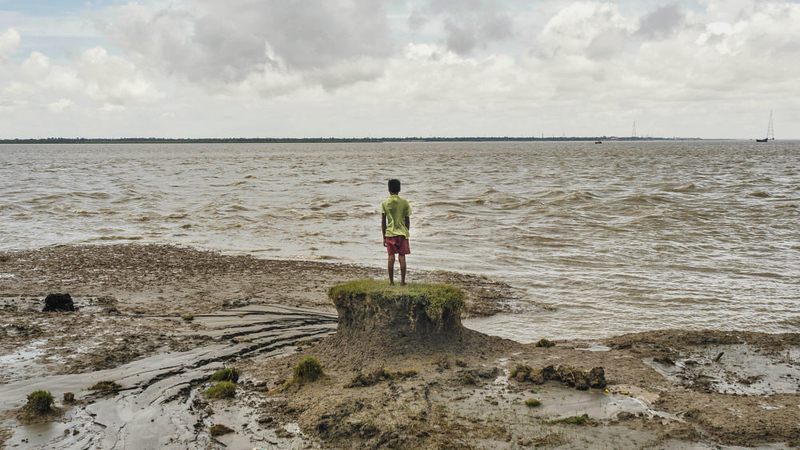 Climate has always changed, but humans are now the main drive for change. a. Rising atmospheric CO2 levels, primarily a result of fossil fuel emissions, have become the predominant cause of continuing climate change. b. Climate change is driven by cumulative CO2 emissions. The United States has contributed a disproportionately large share of cumulative global emissions. 2. Current levels of atmospheric greenhouse gases (GHGs), mainly CO2, cause Earth to be out of energy balance. This imbalance is driving climate change. a. Earth’s energy imbalance is now measured and large. As long as Earth remains out of energy balance, the planet will continue to get hotter. b. If GHG amounts continue to rise unabated, the energy imbalance will drive global warming to levels with climate impacts beyond the pale (see Opinion 3). 3. If high fossil fuel emissions continue unabated, consequences will be predominantly negative for humanity, especially for young people. a. Sea level: Continued high fossil fuel emissions will eventually make coastal cities dysfunctional, with incalculable consequences. b. Species exterminations: Shifting of climate zones, with other stresses, may commit many species to extinction, leaving a more desolate planet. 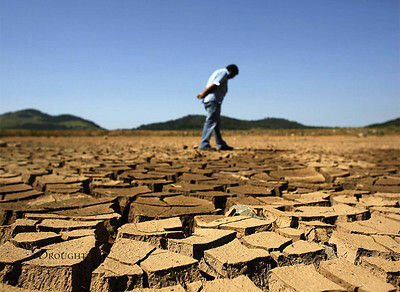 c. Regional climate: subtropics and tropics will become dangerously hot, if global warming continues. Emigration chaos may threaten global governance. 4. 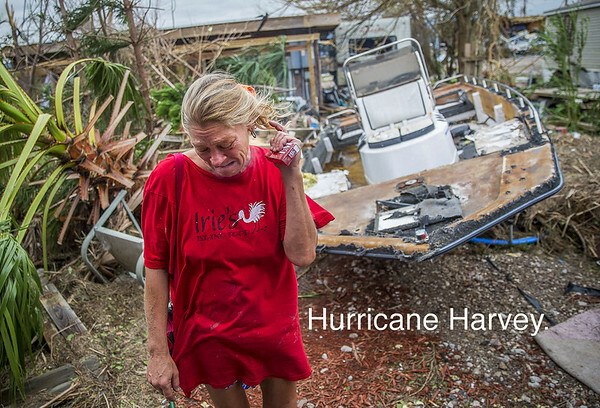 Required actions to avoid dangerous climate change are guided by Earth’s climate history and by the need to restore Earth’s energy balance. a. Science can specify initial targets, sufficient to define policy needs. b. Substantial emission reductions must begin promptly, or climate will be pushed beyond a point at which changes proceed out of human control. a. Action: authorizing, permitting, subsidizing massive fossil fuel extraction. b. Inaction: absence of any coherent, effective program to reduce emissions. R I S KPeople Do Not Get It ~The predictions are ALWAYS optimistic. ~No one is acting like its our only place to live. 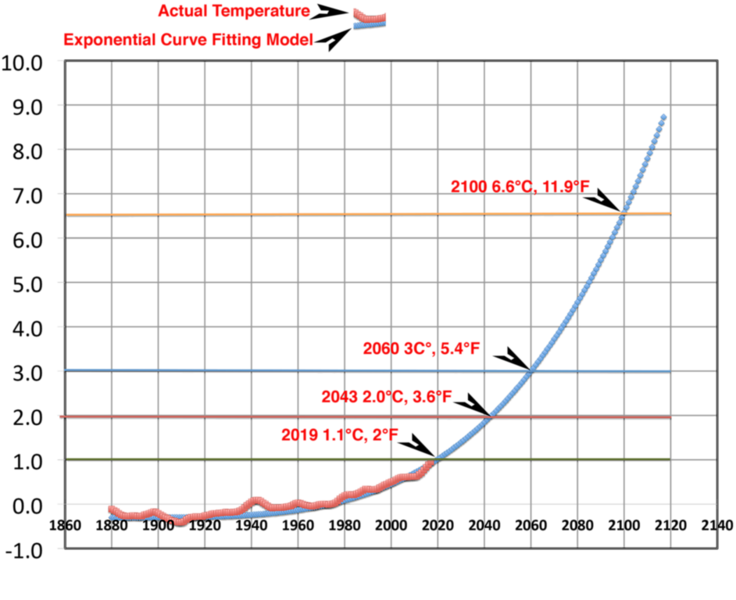 ~We are at the inflection point of an EXPONENTIAL curve in temperature. ~Every child and every child yet to be born will curse us for not doing what we should have done. The Infinite River. It has been to explain something that cannot be explained unless you have had something you thought you understood blow up in your face. The climate of the earth is the most complex system anyone has ever tried to understand AND we are continuing to abuse it by feeding it more and more greenhouse gases. Our predictions are already catastrophic, and they are probably optimistic like all our others have been. We need to be turning ourselves inside out. Every nation. But we are going to smooze like we have in the past. You don't keep flying an airliner to its destination with smoke coming out of the engines. The most likely realistic outcome, taking all factors into account, is a very warm planet able to support about one billion people, about 1/10 of its projected population. Every trillion dollars we spend now will pay itself back and then some. Every trillion dollars we don't spend now will require at least a dozen trillion down the road and a far more hostile planet. But if you haven't been in the risk business, you won't get it. And hardly anyone does. A nightmare and an overview of getting the nations of the world to comprehend how serious the situation really is. 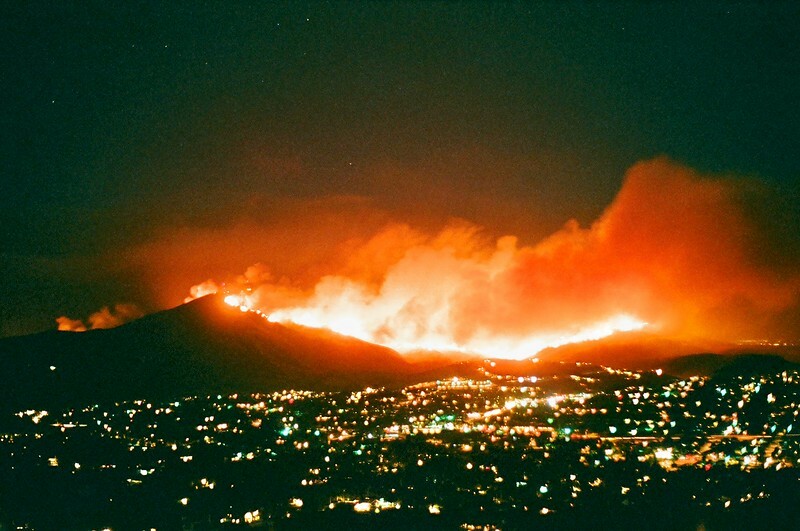 A FIRE TORNADO: a terrifying example of the unpredictability of climate change. As of yesterday (December 15, 2018) the mood from Katowice was upbeat. Agreements were better than expected and there was optimism that the 1.5°C target was doable. However, there was and is a giant fly in the ointment. 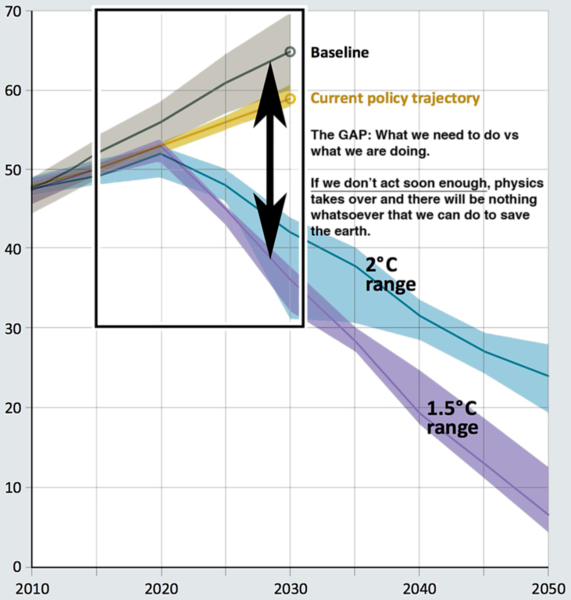 If you look at the graph below, you see a sharp break in the 1.5°C and 2°C emission curves. which means something pretty drastic has to happen soon in order to turn things around fast enough. If such a drastic action were contemplated it would be big news and there was no big news. The Paris Agreement, around which the Katowice meeting was based, is deeply flawed. A good summary is an MIT review of the agreement. The first and last paragraphs of this review are reproduced below. There are numerous other organizations that have made similar comments (including the US EPA), but this is among the clearest. The link is "Last Words from Me" above. However, despite my favorable comments about the review, it focuses on 2°C which is unacceptable. "Talk to leaders who are gathered in Poland. They acknowledge that we aren’t close to getting the job done in reducing the greenhouse gas emissions that warm the planet. People are dying today because of climate change, and many more will die and trillions of dollars of damage to property will occur unless America gets back in the fight." In my opinion, we do not have a prayer of saving the earth with Donald Trump as president. He is doing absolutely everything he can to make the situation worse by INCREASING emissions, but also by taking America out of its essential leadship and motivating role to the rest of the world. The United States is necessary as part of the process not only because of its enormous output of carbon dioxide but because only it has the resources and technical prowess to take on the high risk but essential negative emissions challenge. We are currently trapped between two nightmares: not knowing how the warming process will evolve and a presidential lockdown and lockup of America's contribution. Click on HUMANITY and PROFIT AT ANY COST for more comments. 12-12-2018 "Back to the Epocene"
"Our current rate of warming will quickly lead us back to a climate that predates the evolution of modern humans, according to a new study in the Proceedings of the National Academy of Sciences. 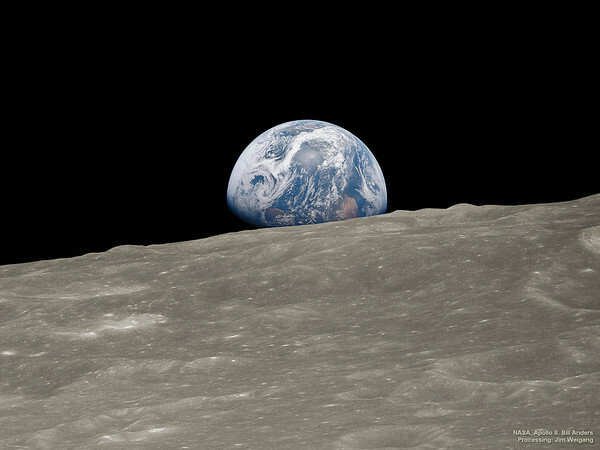 That kind of rapid change has no direct comparison in all of Earth’s multi-billion year history." 12-11-2018 The Arctic has lost 95% of its oldest thickest ice. Donald Trump on climate change: "I don't believe it"
The single biggest obstacle to saving the earth. 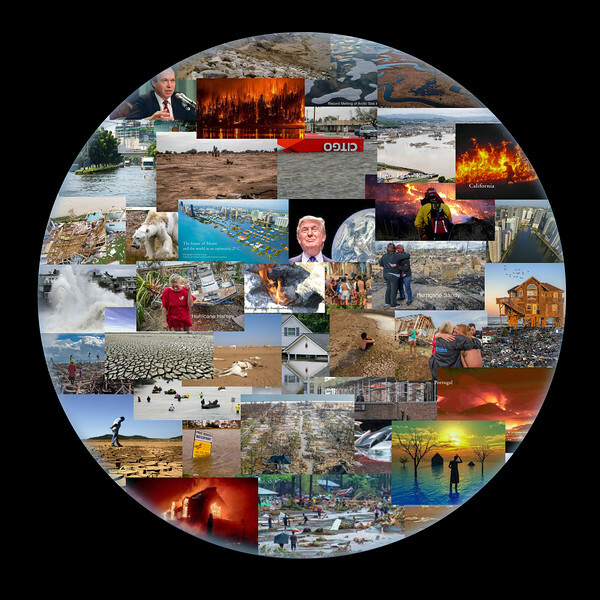 Climate change can be catastrophically unpredictable. 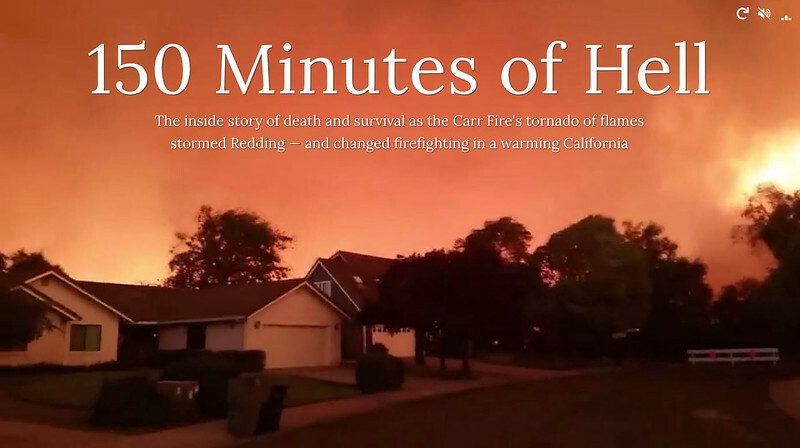 "What Andrews didn’t know was that the Carr Fire — to that point a dangerous but rather ordinary California inferno — was about to spawn something monstrous: a fire tornado the likes of which the state had never seen. The vortex of air ripped around a column of rising heat, flames licking its walls. A freak of meteorology, it would annihilate everything in its path, uprooting trees and crumpling electrical towers. 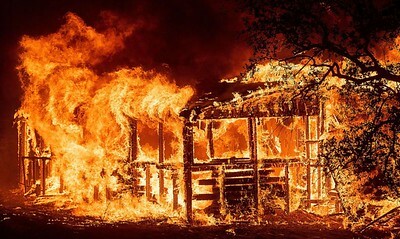 For the men and women who spend their summers on the fire lines, the tornado was an ominous glimpse of the extremes our warming climate will bring." 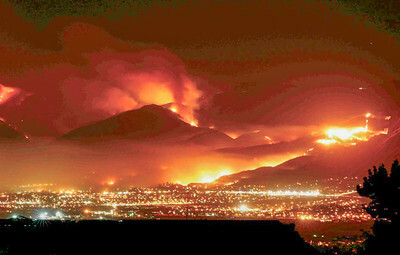 Above: Fire tornado from helicopter. Pretender to the Throne of "Chief Arsonist"
click for more on "chief" Trump: WOULD YOU LIKE THIS MAN TO BE YOUR FIRE CHIEF?